Mad River Mountain in Logan County is Ohio’s largest ski resort and is within two hours of over 2 million people. Mad River Mountain’s popular Avalanche Tubing Park has 10 fast lanes. Looking for something new and fun this winter? Try skiing! ZANESFIELD – Yep, the ski season is in full swing and it’s time to start talkin’ “powder,” playing in the snow and gettin’ under some “big air,” as they say. Remarkably, there are eight ski resorts within a 25 minute to two hour and 45 minute drive from the Indian Lake/Urbana area. Each offers skiing, snowboarding, tubing, lessons, rentals, concessions and more. With the topsy-turvy weather we have had this winter, the snow-making machines at area ski resorts have been working overtime pumping out the man-made powder like there’s no tomorrow. “Big” cold weather has finally arrived with some decent snow accumulation, supplemented with snow cannons cranking out even more of the white stuff at area ski resorts. This additional stockpiling on-top of mother nature’s own fresh powder will keep the gnarly downhillers happy even if it warms up a bit for a few days here and there for the rest of the ski season. Ski resorts in Ohio also benefit from the region’s lake-effect snows from Lake Erie, which typically ensure plenty of natural snowfall from December through early March. Now is the peak time to get some big thrills downhill and take advantage of the fact that we live on the edge of Ohio’s snow belt. Winter doesn’t just have to mean a long cold wait until the warm weather comes back. Get out and try something new and enjoy the beautiful snowy landscapes and the exhilarating speeds of downhill skiing. Ohio’s largest ski resort is home to Ohio’s largest snow making system, with more than 120 fan guns that are able to pump out 7,000 gallons of water per minute covering their entire 144-acre resort with snow-piling in as little as 72 hours. Check out their impressive new 46,000-square-foot grand resort lodge, almost twice the size of the old lodge, which was destroyed by a fire in 2015. The new ski lodge, which grand opened two years ago, is Ohio’s largest ski lodge. The two level lodge features a loft area on the second level with elevator access, bar, retail space, cafe, a live music stage, a slope side deck with impressive views of the mountain and seating for over 300 skiers and snowboarders. The first level dining area has double the seating of the previous lodge with over 800 seats. 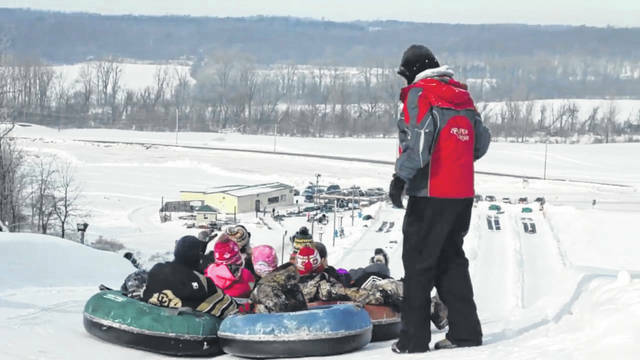 Their popular Avalanche Tubing Park is the largest in Ohio, and features 10 fast lanes and an automated carpet lift that carries riders effortlessly to the top. The resort hosts many popular events, festivals, parties, concerts, contests, ski tournaments and expos every year. It’s just a short easy drive from the Urbana/Indian Lake area. This Zanesfield, Ohio resort is tops on the list as a local favorite with over 12 lifts, 20 trails, a 1,460 ft mountain elevation, 4 Terrain Parks, Ski school, Ohio’s largest tubing park, 144 skiable acres and a 300 ft vertical drop. Located just outside of Cincinnati in Lawrenceburg, Indiana, this tri-state favorite has 20 lifts and over 80 trails for skiers and snowboarders. Check out the gigantic tubing park and the 70,000 sq/ft lodge. With a 400 ft vertical drop and a one mile run you can’t go wrong here. 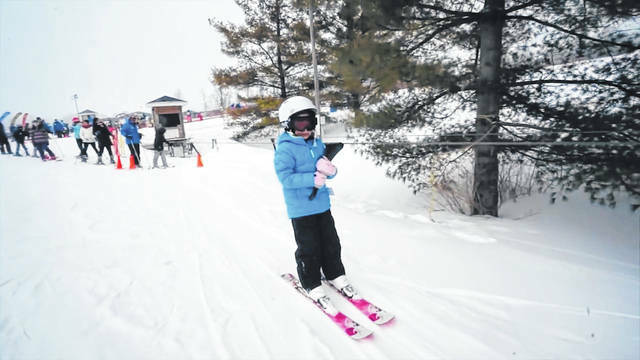 This Chesterville resort, located in the heart of Ohio’s snow belt, features 11 slopes, an extreme park, Ohio longest half pipe, a tubing park, a learning center and a chalet. Located near Mansfield, Ohio, this ski resort has 12 slopes and 13 trails with a maximum 300-foot vertical drop, a tubing park, a terrain park and a ski school. This popular resort, located in Central Indiana, has a whopping 25 lifts, 75 trails, a beautiful ski lodge and a super tubing park. The resort boasts a snow making system that can make 12 inches of snow in one night over the entire 65-acre resort. Two separate resorts, owned by the same management company, are located just five minutes apart in Peninsula and Sagamore Hills, Ohio. These resorts offer night skiing, a terrain park, a half pipe, 18 trails, and 15 lifts. Lift tickets and passes are valid at both parks. Check out the Polar Blast tubing park at Brandywine for some great family fun. Located in Painesville, Ohio, this resort offers 9 slopes, skiing, snowboarding and tubing with a maximum 175-foot vertical drop. Located near Mansfield, this place has re-invented itself into a multi-adventure park and offers great snow tubing featuring steep, fast 600 foot runs, sledding and snowmobile riding.